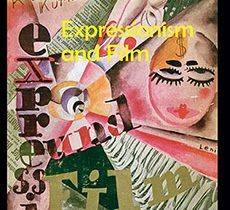 90 years after its initial publication, my translation of Rudolf Kurtz’s Expressionism and Film is available in English! Originally published in German in 1926, it is not only a classic of film history, but also an important work from the early phase of modern media history. Written with analytical brilliance and historical vision by a well-known contemporary of the expressionist movement, it captures Expressionism at the time of its impending conclusion—as an intersection of world view, resoluteness of form, and medial transition. Though one of the most frequently-cited works of Weimar culture, Kurtz’s groundbreaking work, which is on a par with Siegfried Kracauer’s From Caligari to Hitler and Lotte Eisner’s The Haunted Screen, has never been published in English. Its relevance and historical contexts are analyzed in a concise afterword by the University of Zurich scholars Christian Kiening and Ulrich Johannes Beil. Lavishly illustrated and distributed for John Libbey Publishing by Indiana University Press.